The Zuytdorp, on its voyage to the Dutch East Indies port of Batavia, ran into an unexpected storm as night came on. It was one of those squally things: a threatening cloud mass bearing down on them with frightening speed as the ship ran under short sail before a northwesterly gale. Jan Bakker, the first mate, a burly man in his late twenties, worried they might be too near Eendrachtsland, the great south land. He hated this blind sailing when he didn’t know what lay ahead. You couldn’t rely on dead reckoning. If he were Marinus, the captain, he would turn north now and make a run to the Sundra Straits. He watched the storm approaching. The dark clouds spread across the horizon, blotting out the setting sun. The wind caught the sails before they had time to haul them down and the sea turned into a raging animal. Hugh swells swept across the deck of the ship, taking everything, man and object not battened down. Jan held to the rigging to stop from being washed overboard. Rain whipped his face and hands. He ducked his head involuntarily when lightning struck the topmast. A wind gust stronger than any before drove the Zuytdorp forward. Jan could barely hear William’s voice above the storm’s din. Jan turned. Ahead, out of the rain and darkness loomed cliffs more than twenty times higher than the Zuytdorp, then were lost in a veil of rain and spray. Jan thought he had imagined them, then lightning flashed, and they were there again. The lookout had seen them, too. He shouted a warning to the captain. Marinus bawled orders to tack. Men sprang into action as they tried desperately to turn the Zuytdorp from smashing against the cliffs. We should have turned north before the storm hit, Jan thought as he strained on the ropes, nearly pulling his heart out. These big square-riggers couldn’t tack effectively before a gale. Then when he thought the Zuytdorp would smash head onto the cliffs, the ship swung aside. “Thank God, we’ve escaped,” he muttered as he held on to the rigging and tried to get his breath. The sound of grating came over the piecing noise of wind and driving rain. The men in the rigging stared in horror at each other. The deck tilted as the Zuytdorp ripped her bottom out on the rocky platform and left her lead ballast on the sea floor. The surf swept over the angled deck as the rising sea drove the ship sideways towards the cliffs. The hull crashed on the reef with each monstrous wave. Cannon broke loose and hurtled across the deck. A mast snapped and fell in a tangle of rigging and sails. Those who weren’t injured, killed or swept overboard in the first minutes of the disaster clung to the rigging. Jan hung on through the night, enduring the biting wind and teeming rain. Before dawn, the wind dropped and the rain eased as the sun came up. Cold and exhausted, the survivors stared at the calamity surrounding them. The flooded ship had heeled over on its side against the reef as the surging sea pushed it towards the rocky shoreline. Willem fought his way along the sloping deck to reach Jan. “We’ll have to get to shore. The ship will break up on the reef.” As he spoke, a huge wave emerged from nowhere and beat over the Zuytdorp’s deck in boiling white foam. Waves taller than houses crashed over the decks. The wind might have died down, but the sea didn’t look like it was ever going to calm. “I’ll tie a rope around my waist and make a dash across the ledge,” Willem said. How like the resilience of youth to think he’ll succeed, Jan thought. A rope won’t save him if the sea smashes him against the rocks, but if anyone can make it, it will be an agile young man like Willem. From the fallen mast, Willem cut a length of rope and tied it around his waist. “Does it look secure enough?” he asked Jan as he pulled at the knot to make sure it was tight. “In luck, you mean.” Willem gave the other end of the rope to Jan before he climbed over the side of the boat. He stood on the ledge with the water surging to his waist and tried to keep his balance. Before he could steady himself, a wave washed over him and knocked him over. For a moment, Jan thought he would be crushed between the Zuytdorp and the ledge, but the boy clambered to his feet and began his struggle through the boiling surf. Jan held tightly to the rope, ready to pull him back if he was swept into the sea. He glanced at the other twenty or so crew who stared over the ship’s side at Willem, their expressions dazed as if they couldn’t comprehend what had happened. He took in their identities. He hadn’t seen Marinus since he had heard him screaming out orders last night to the crew before the ship hit the reef. There were ten or more bodies floating in the sea. He couldn’t see if Marinus was one of them. He watched Willem negotiate the slippery rocks in spite of the waves crashing against him. Once he slipped and fell under the raging water. He gripped a jagged rock, his fingers curling into it when the surging water would have taken him into the sea. When the water receded, he regained his feet and stumbled the few paces to shore. Undoing the rope from his waist, he looped it around a boulder and tied it as taut as he could make it. He waved his arms and shouted to Jan, but the words were lost in the surf’s roar. He climbed over the ship’s side and grasped the rope. Placing one foot after the other he struggled across the rocky ridge between the stricken Zuytdorp and the shore. When he was within arm’s length of Willem, a wave, bigger than any of the others crashed against him and swept his feet from under him. He clung to the rope when the undertow tried to drag him into the sea. Willem stepped into the water and pulled him to safety through the foaming water and up onto the rocks out of reach of the raging foam. Dripping wet, Jan scrambled to his feet. His head bled from a gash on his forehead and his hands were torn and cut from the sharp rocks. He stared at the Zuytdorp askew against the ledge. From here it was worse seeing the ship he loved and had been proud to sail in, pounded to pieces. It was a bad dream, a nightmare he would wake from. He waved to the men left on the Zuytdorp. As he watched, one slipped over the side and began the perilous journey across the ledge. Willem returned twice to the Zuytdorp to help a shocked survivor reach shore. By late afternoon, everyone stood on the cliff top, staring at the stricken ship. Jan counted twenty-nine survivors. We are all there are left of a crew of two hundred souls, he thought in anguish. During the days, which followed, the men built a bonfire of branches they dragged from the bush. They talked about the Kochenge that the faster Zuytdorp had left behind a day out from the Cape. The Kochenge would see the bonfire and send a boat to rescue them. Their other hope was the Belvliet, scheduled to leave the Cape soon after the Zuytdorp. Following her, three more Company ships were expected to depart. Everyone agreed they wouldn’t have long to wait before they were rescued. Jan shaded his eyes in the bright sunshine. Please, God, please don’t let the ships pass by in the night. When the men awoke one morning to find the sea calm, they could scarcely believe it after the raging waters of the past week. There was scarcely a whitecap to be seen. The Zuytdorp sat on the flat sea riding the little waves, which ran up onto the ledge and back to the sea. The men made their way across the rocky platform to the Zuytdorp. When they reached the ship, they worked fast to salvage what they could. They suspected this gentle lull was unlikely to last. By late afternoon the sea had come up again. Waves, which would knock a man off his feet and sweep him into the sea, smashed in vengeance against the rocky shoreline. The men had rescued enough barrels of food from the ship to last months, but drinking water would be a problem. Now water lay in pools in the limestone gullies, but they would have to find other sources of water. They had brought wine and spirits from the wreck. The heap of empty green bottles grew. Jan stepped around two men wrestling on the ground. They were too drunk to hurt themselves. They were fools, who had forgotten their plight. Wine and spirits were the masters now. With the captain dead, he as first mate had tried to take command, but they ignored him. “I can see a sail,” a voice shouted from the cliff top. The men drifted away. One stopped to gaze at a pile of green bottles, most of which had been smashed when they were carelessly thrown onto the heap. Jan sat on a limestone block at the head of the steep track everyone used to climb down to the Zuytdorp. One of the ship’s masts still stood upright. The surf had driven the hull into the shallow water beside the rock platform. Like a gallant beast, she had gone to slaughter. The tears ran down Jan’s cheeks. He had sailed with her through many an ocean storm, but now ill luck and incompetence had doomed her. Images of Tanneke, his little daughter, he and his wife, Els, had named for his mother, overwhelmed him. Dear little Tanny and Els. He wiped the tears from his eyes. Poor Els wouldn’t know of his shipwreck on this desolate coast. Willem joined him. They watched Dirk and Leon, the only two soldiers who had survived the wreck, struggle to remove one of the cannon from the Zuytdorp. “Why do they want to bring a cannon ashore?” Willem said. Willem shaded his eyes against the harsh glare and peered seawards. “Is that a sail?” He grabbed the telescope from the wooden box, which was weighed down with stones for safety. “It is a sail,” he cried. As one, the men rushed to the top of the cliff. Jan had the telescope whipped from him. The man held it to his eye. “I knew we’d be rescued,” he cried. “Light the bonfire. Light the bonfire,” the men cried, milling around on the cliff top. The grass leapt into flame. They thrust on more bundles of grass and leaves until the stack of wood flamed into the sky. “They’re sure to see it,” a man cried as they flung on wooden chests and broken planks, which had been washed ashore from the Zuytdorp. “It’s too late to send a boat tonight. They’ll wait until morning,” they assured each other. They kept the fire burning all night. When morning came, there was only the turbulent green sea, the pitiless blue sky and the sun. Danyari is in Australia. A very large rock formation held in revere by the Aborigines. It also serves as a setting for an excellent book entitled Wind from Danyari which has been around for a little while but hasn't been heard about. The tale begins in the 1700's when a Dutch ship crashes on the shoals in a cyclone. The survivors pass away slowly and, after six months, only four are left. Of those, one is murdered by a soldier/survivor and that soldier falls to his death in an ensuing struggle with one of our early heroes. Jan is close to death when he sees a figure on top of the hill. He leaves a locket, his only possession from home, and in return he and Willem receive a shell full of water. Djanduin decides to try to save the men although the tribal Elders tell her to let them die. This salvation begins a chain of events involving Aborigines, whites and the unforgiving Australian outback. From Djanduin who thinks the gold jewelry makes her magical to Joe Hennessey who not only conquers the surroundings but his early years with an abusive father, to Rosa and Flora - grandmother and grand-daughter - the tales weaves along. Through the 1800s into the Twentieth Century we learn of Australia and its inhabitants and their struggle to survive. Although I had passed this book by several times, I was really glad I chose it for my next review. The descriptions of the terrain, not to mention those of the characters, just kept me reading on. It was a good blend of love, struggle and overcoming horrible odds. I highly recommend Wind from Danyari book. This first book in a trilogy covered the time period 1712 through 1939. That alone is indicative of how this book might be viewed. The first third of this manuscript was hard to read and fairly gory in nature. Since I knew it was to be about the Hennessey family in Australia, I kept reading, determined to find and enjoy Ms. Laurel Lamperd’s story. I am proud to say that it finally did progress into a very interesting book which I found captivating to read and well worth my initial efforts. The book covered the lives of four generations which readers can identify—Joe, his son, grandson and great-granddaughter. How these generations are depicted was quite an undertaking considering this book was not what I would classify as a romance book. The storyline followed Joe who ran away from home and his drunken, abusive father. It continued the interactions of whites and the aboriginals and slowly brought the book more in line with a historical romance. The consequences of the superstitions of the aboriginals established the route these white man and their families would follow for the years to come. 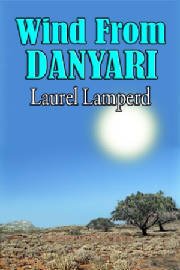 This is not my first Laurel Lamperd novel. That may be why I was so determined to continue reading when I got bogged down in the early history at the beginning. I was well aware that Ms. Lamperd demonstrates that she has a gift for writing. This book progressed into an incredibly interesting story of generations of Hennessey’s. Even at this point, romance was not pivotal in the storyline. I do admit, however, that when the book ended, I was not ready for the finality of it. That’s the beauty of series—and the reason I love them. The ending of this first book is surprising and ended at a somewhat unusual place in the lives of the Hennessey’s. Overall, the book is a good read and for history buffs, it will certainly be a winner. I recommend this book for anyone who enjoys more than romance incorporated into the main story. Joe Hennessey’s story begins in 1885 when, at the age of sixteen, he escapes his abusive father. He heads to Wyndham to search for wealth in the gold fields. Instead, he finds providing necessities to the miners is a more lucrative business than panning for gold. A series of several jobs gives him the opportunities he desires—a sheep station and family of his own. Alicia Pennington is a well-raised young lady of twenty-five when she first meets Joe Hennessey. Her mother encourages her to marry a proper Englishman with a good pedigree, but Alicia desires Joe above and beyond all others. After a few secret encounters she agrees to marry him, but Walara—the sheep station—is not the life she imagined it would be. This is the story of the Hennessey family. Joe Hennessey creates a life which is vastly different from his childhood. After meeting Alicia and taking her away from her snobbish family, he attempts to make her happy at Walara. Life in the Aboriginal boundaries is hard and not quite what Alicia expects. The Aborigines' way of life is at odds with the Hennessey family’s, and trouble is bound to occur. Joe and his descendants face many trials in a harsh land that proves to be as unforgiving as the natives. This is a story of such wonderful and vivid individuals. The land is a character in its own right and proves a worthy opponent for the Hennesseys. The charm of these people and this place truly spills over to the reader, moving them to keep reading. I am amazed at how immersed I became in the story unfolding on the pages before me. I found I finished this book without really noticing I was turning the pages. Ms. Lamperd takes the reader on an adventure of a lifetime in a few short hours, and I am glad I was invited along.